Frances E. King was born on June 22, 1926 to Charles and Irene Whitlock in Mexia, TX. She passed from this earth on Thursday, September 27, 2018, at the age of 92. She was preceded in death by her husband, James King; granddaughter, Laura Wansley Bailey; sisters Hazel Miller and Delores Morehead; and brothers Charles (Son) Whitlock, Jr. and Howard Whitlock. She is survived by her son, Ron King, and wife Peggy; and her daughter, Carol King Wansley and husband Dave. Her grandchildren are Angie Turbeville and husband David; Keri Wright and husband Kyle; and Kory King. Great grandchildren include Casey Fairess; Amber Akien; Katie Wright; Maggie Wright; Lilly Wright; and Gwen Wright. She leaves behind numerous nephews and nieces, and a host of friends and church family. 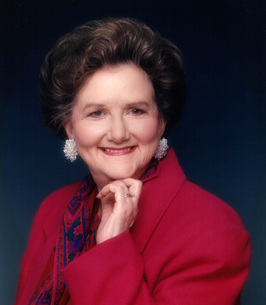 Frances lived most of her life in Corsicana, TX and enjoyed partnering with her husband to run both their grocery store and their home building and development company. She and James were happily married for more than 55 years until his passing in 2002. She had a wonderful sense of humor. Frances had many interests, including writing short stories and books. She taught Sunday school and a ladies Bible study group for many years and was a long time member of the First Baptist Church of Corsicana. Honorary pallbearers will be Joe Allen, Kenny Maxfield, Tom Lucas, Dr. Scott Middleton, Monty Trimble, Joe Bob Tekell, Alan Waldrop, and Jon Ed Ingham. Officiating the service will be Phillip Keltner, who will be assisted by Marilyn Atwood Schmidt. Special music will be provided by Sandra Huffman and Dr. Shellie O’Neal. Visitation will be held at 1:00 PM on Sunday, September 30, 2018, followed by funeral services at 2:00 PM at Corley Funeral Home. A private family burial will follow the service at Resthaven Cemetery in Corsicana. An online guestbook is available at www.corleyfuneralhome.com and selecting the Frances E. King obituary. To send flowers to the family of Frances Eleanor (Whitlock) King, please visit our Heartfelt Sympathies Store. Dear Family, I am so very sorry about the loss of your dear loved one. May the thought at Job 33:25 give you comfort in knowing that Mrs. King will return to the days of her youth and be able to enjoy life without the infirmities of old age. My sincere condolences to you. Carol, I am so very sorry to hear of the loss of your beautiful Mother. Only God can offer love more unconditional than our Mothers. May God bless and comfort you and help you find peace. My prayers are for you and your family.